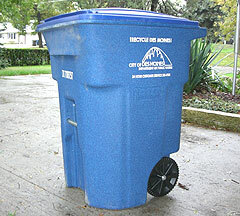 Iowa’s largest city and the surrounding metro area are changing their curbside recycling program. Amy Horst of the Metro Waste Authority says Des Moines has already gone to "single-stream" recycling and the other metro cities are set to switch over as well. The single-stream program allows residents to put recyclable materials into one large container that’s similar to a garbage can. Horst says all the current materials, paper, plastic, glass, newspaper and cardboard goes into the container without any sorting needed to make the process easy. "The hassle and the worry and the confusion should be gone," Horst says. Altoona, Ankeny, Bondurant, Clive, Johnston, Urbandale and West Des Moines have all tried the new system and are ready to switch over. Horst says they had city councilmembers from the cities take home the containers and try it out and she says those people felt they recycled more because it was easier to do as they didn’t have to sort and stack the materials in any particular way. Horst says they hope all residents will increase the amount of material they recycle with the new system. Horst says changes in the way the recyclables are handled after they leave the curb have made the new system possible. Horst says the technology has improved to allow for very little "hands on" sorting of the material by collectors, as they now use various conveyor belts and electronic and technological sorting systems instead of having people sort the material. Horst says they don’t know the exact cost of the new system, but they expect that collection will cost less than the current bins that are used for recycling. The new system has trucks with automated arms that pick up the 96-gallon container and dumps it into the truck, similar to the automated garbage collection trucks. Horst says the system will save in labor costs and time for the hauler. Horst says the new collection containers have lids and that should help prevent recyclables from flying out. Des Moines residents recently started using nearly 40,000 of the blue bins for their recycling and Horst says the rest of the metro area is set to start converting by July 1st of 2009. She says that’ll mean another 75,000 or so new recycling bins. Horst says several cities across the country have switched to this type of single-stream system, or are considering doing so.